Do you have a preference on what floor you live on? * What Is The Name of Your Brokerage? 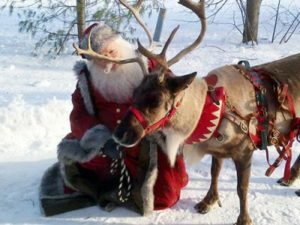 This Christmas season all kids (big and small) will have an opportunity to visit with Santa in his big sleigh when he comes to downtown Collingwood on Saturday, November 24, December 1, 8, 15 and 22. It is with great pleasure that we announce that Santa will be available for all to give him their wish lists beside our town hall from 12:30 p.m. to 3:30 p.m. on the Saturdays leading up to his big night. 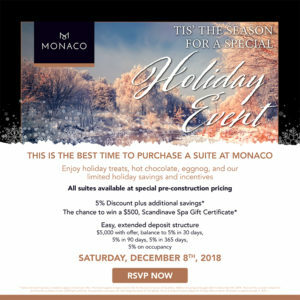 Join us on December 8th from 12 p.m. to 5 p.m as we bring in the Holiday Season at the Monaco Presentation Center. Come and enjoy some festive beverages and holiday treats. We are happy to provide a gift to you of a 5% discount on available suites. 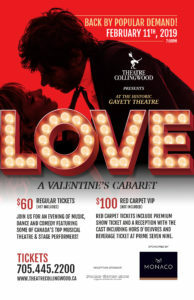 We look forward to seeing you on Saturday. ALL RIGHTS RESERVED. PRICES AND SPECIFICATIONS SUBJECT TO CHANGE WITHOUT NOTICE. ALL ILLUSTRATIONS REFLECT ARTIST’S IMPRESSION. E. & O. E. SEE SALES REPRESENTATIVE FOR DETAILS.